The morning is still. There is no wind. No sound. Only my breathing, which comes in clouded puffs that swirl and freeze to the fabric of the tent. I see them all, every breath of the night, frozen across the fabric. The sun is still below the horizon, but the world is all white outside. It looks like snow, but it hasn’t snowed for weeks. It’s all icy bits of condensation, fog pulled out of the air and left frozen against every branch and stem, built into ribbons of white that stretch out until they crack under their own weight and crash to cover the ground like snow. I peer out and want to curl back under my sleeping bag. I want to burry myself in down and fabric, layers of bags and jackets and hats and scarves, until only my nose and mouth remain visible, just enough to breathe and no more. I want to sleep like that until the world outside isn’t frozen anymore. I look at my altitude. 600 meters. 600. Gotthard Pass is 2,100, another 4,500 feet. One pass and I can cross the Alps. One pass maybe a week away. One single pass. 3.5 degrees colder every thousand feet. 3.5 times 4.5. Round up. Another 16 degrees cooler. One pass. No way. Quit dreaming. I pull down the sleeping bag’s zipper and twist open the nozzle on my mattress. Air whooshes out of it and I sink to the cold ground underneath me. I can’t wait for the world to unfreeze. This isn’t a snap, this is December. I have to move. There is no end to the cold, not here, not until spring. My fingers numb out and ache as I rush to roll my tent up and squeeze it into the bag. I throw it onto my pack and start walking, start pumping blood, start feeling heat trickle out from my stomach and back to my finger tips inch by inch. The world is all ice on top of this mountain. No, not a mountain, a hill. A bump. An afterthought of the Alps and it’s still all ice. 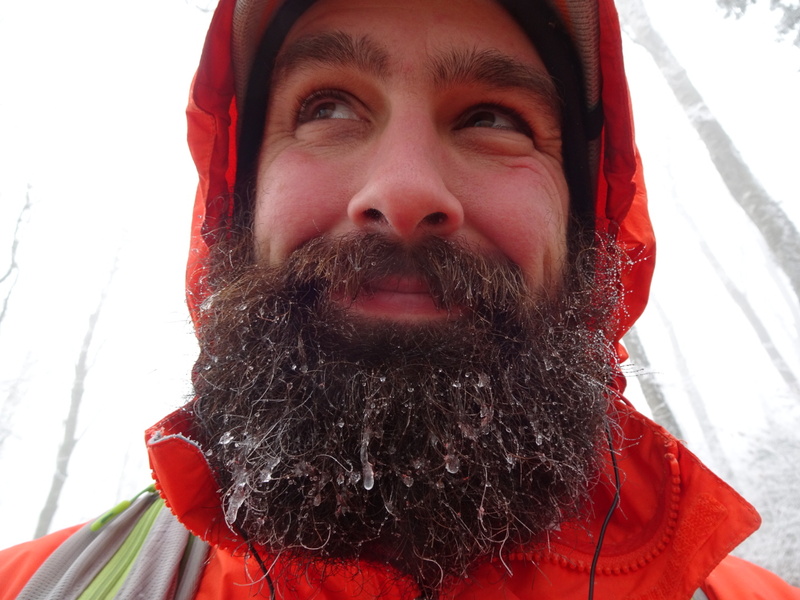 The tips of my beard freeze together with the condensation of each breath. The ground crunches under my weight. I curve off to one side of the ridge and drop out of the wind. The ice disappears. No fog, no moisture to freeze out of the air, no ice. Remember that, I think. Remember because that could save you one night. This is not snow, this is ice and there are pockets where you can hide. Remember. My heart keeps pumping and my hands come back to life. The cold remains, but I’ve outrun it for now. Walking becomes easy. I shift hats and jackets and ride the thin edge between cold and sweat. I stare at the endless sheet of grey as I walk. Maybe the sun is up there somewhere. Maybe if I were higher, maybe then it would not be so cold. Maybe. Maybe there is still a way. I reach Aarau, a city I heard of once, long ago, in the rain a few days south of Nordkapp. I was just starting then, 300 miles in, and I was standing by a tent with two fishermen from Switzerland, laughing about the rain, promising each other that tomorrow would be better. I remember asking about the Alps, asking if it might be possible to sneak across late in the year. We all laughed. The Alps. Switzerland. It also felt too far away to be real. Then he looked at me and said that maybe, maybe there would be a way through. It all depends on the snow, the timing, and luck. I walk the narrow streets of Aarau toward Fritz’s house. I remember that fish he gave me after we joked about the weather and promised it would be better tomorrow. I remember cooking it and staying in my tent for 24 hours straight while I went half mad waiting out Norway’s rain. Maybe, I think. Maybe luck is still with me. Posted in Europe North to SouthTagged Alps, backpacking, ENS, Europe North to South, featured, friendly strangers, hiking, Switzerland, thru-hikingBookmark the permalink. You, as a Floridian and regardless of your many adventures, are still new to snow and ice. Keep observing D. Maybe you will see why Eskimos have 50 different words for snow. Better hitch a ride through the tunnel. Hope your luck is still with you. Another big hug.